Take a walk around your home, does it reflect your desires? Are you surrounded by a collection of items that trigger happy memories? Are you holding on to things you really should be kicking to the kerb? If you are, it’s time to kick it! Let’s start living the life we love in the home we love. I surround myself with things I love because my home is my sanctuary, a haven in which I feel totally relaxed. So filling it with items I adore is an absolute must. Over the past ten years, I have gone to town on the beaded, pom pom, tassel variety from nearly every country I have travelled. You can imagine how much Bruce loves travelling with me knowing I need to go into every little market stall selling anything close to looking like a tassel! 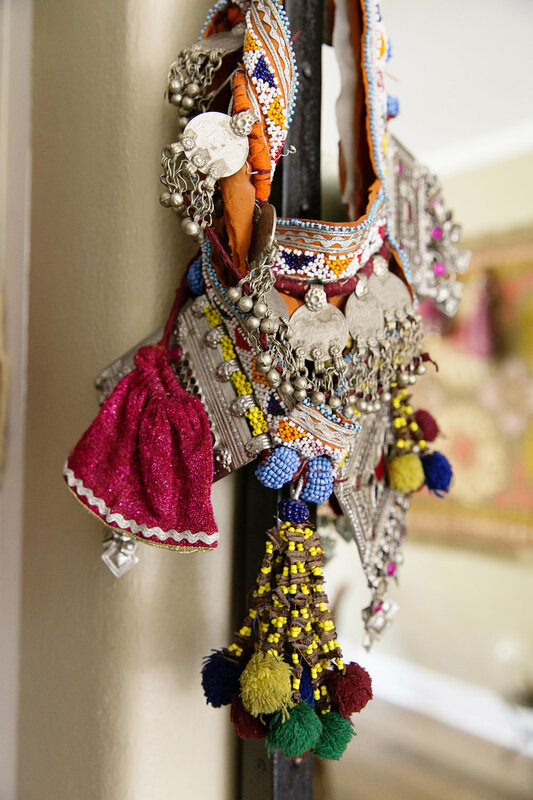 Decorating with souvenirs collected along your travels makes for a beautifully eclectic and layered home. These tokens will remind you of places once explored and act as a great conversation starter when guests come to visit. My house has really turned into a treasure trove, and I could not be happier! Simple Tassels can look good on bags, door handles, and over cloches - experiment! Just layer! candles on books on stools, surrounded by candles, surrounded by trinkets. If you’ve got it - flaunt it. Frame favourite post cards or menus from a special place to remind you of fun times. Find beautiful fabric even if it's from a jacket or dress and recreate into a cushion. For some strange reason I collect children's shoes from around the world. 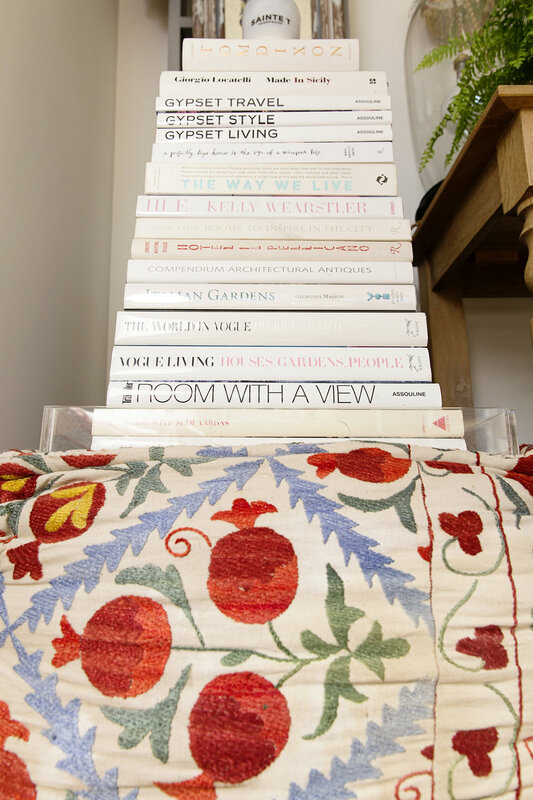 Sitting on a pile of books or under a cloche looks great. Choose a candle smell that's a little exotic to give your house the scent of somewhere far away. Buy great old necklaces and hang off ladders, book shelves, doorknobs etc..
Keep small trinkets together in a beautiful bowl - it will make something small look stronger. Be quirky and fun when displaying things and try moving your collections around from room to room. Books are a huge part of my life and having them on display at home has become a bit of an obsession of mine. I will admit that while the piles of books in my home look random they most certainly are not! Each pile has matching spines, similar book content and is where it is for a reason. The coffee table books are mainly about styling and homewares because when I am on the couch, they are my favourite type of books to flick through. Next to couch is the pile of magazines to relax with while drinking some tea. The dining room books shelves are filled with styling and travel books as they are surrounded by my favourite family holiday pics. There is a method to my madness. I NEED TO HAVE FLOWERS IN MY HOME! I know, it's indulgent and a little obsessive but I love nothing more than walking into my house and smelling flowers. It’s one of those simple things that makes me happy. Flowers are the perfect accent for any room, they can brighten up your entrance, they can add detail and warmth to a boring coffee table and they can make your bathroom scream luxury if placed next to a dull sink. They are the final touch in a great space. I have spoken before about how I adore ferns and having them about my home has created a lush ambience. Introducing a little green indoors really can lift your mood and the mood of the room - this is going to sound a little crazy but every time I walk past one of my ferns I have to touch it! Running my hands over their soft fronds is one habit that I like! Whether it be herbs in your kitchen, flowers on your bedside table or a potted plant beside your basin - it’s little touches that can lift a space. So in these cooler months when you are snuggled up indoors, bring the outdoors in! Surround yourself with flowers, cut a few branches and stems of trees and fill a vase - Surround the vase with candles and bask in the warmth it creates. 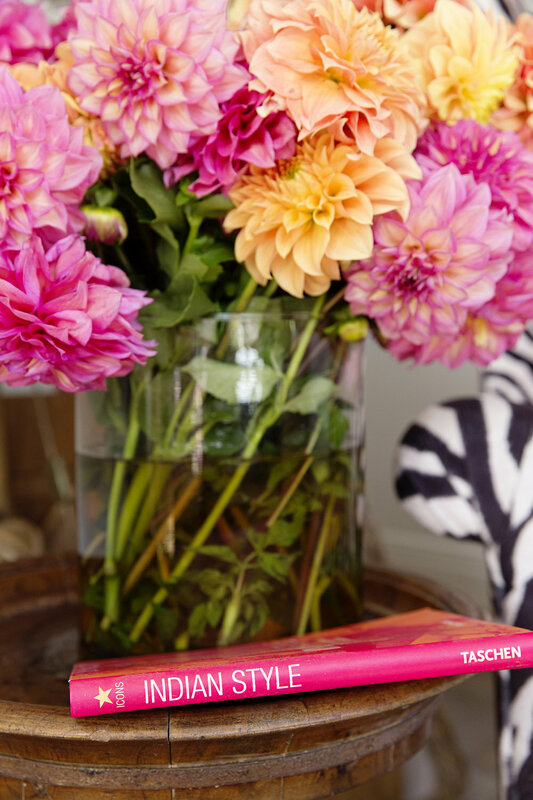 Get those flowers into a warm water vase as soon as you get them, and try to not to overcrowd them in the vase. We all thrive when given a little space to do so! Change water regularly, it's good for the flowers and looks neater. Add a little apple cider vinegar and sugar to your vase to keep water fresh longer, don't ask me how it works; it just does! When you change the water in your vase, trim the stems a little. You can also trim the leaves off the stems, this saves them from dying off and discolouring the water. Once one flower in the bunch is starting to look a little sad, get rid of it. Is your room too hot? Flowers will wilt in winter so keep them in a space that doesn't get too hot. Inspired? Time to make your house into a home filled with everything you love, tag #chykahome on your socials so I can check out your space!